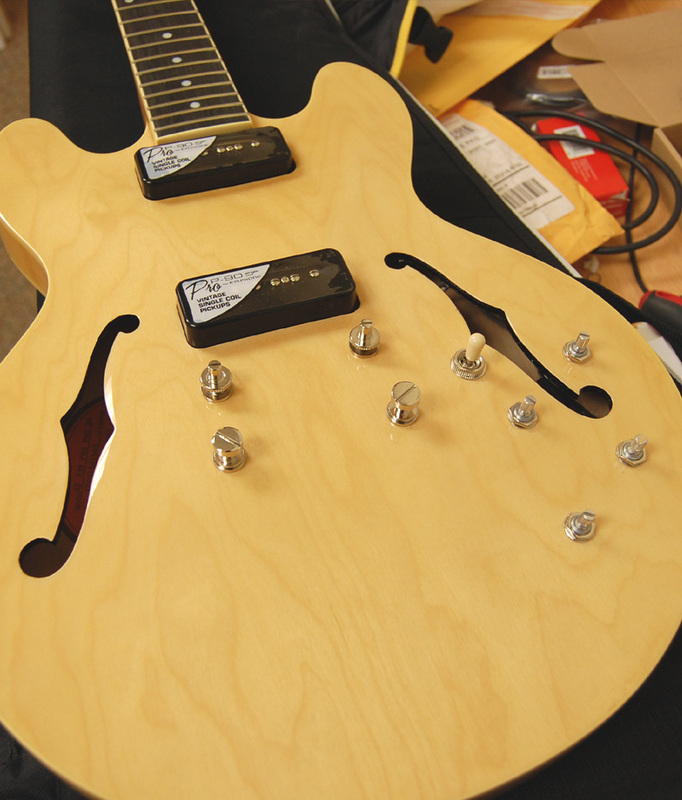 We take a plain Jane guitar and make it prettier, warmer looking and more inviting. 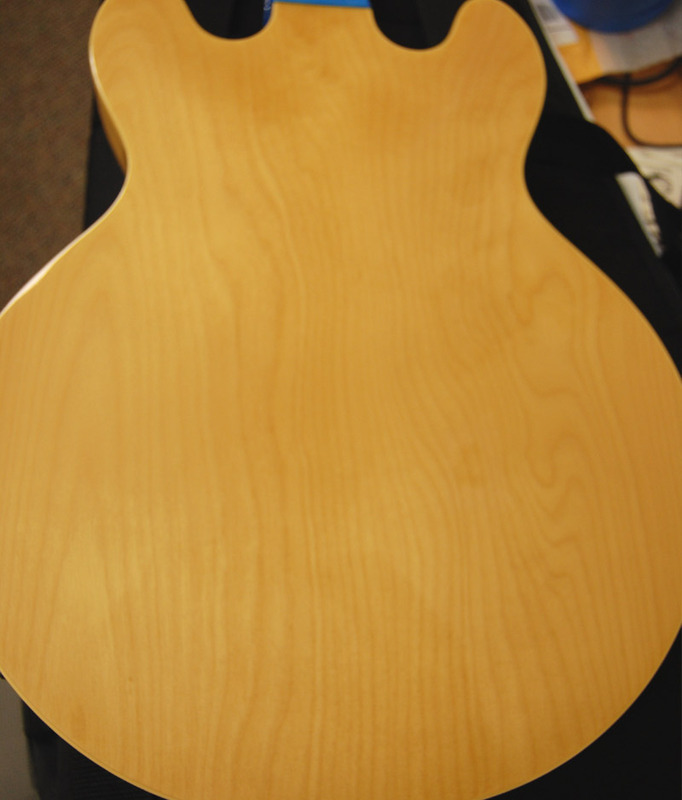 We start with a bleach white guitar and prove what violin makers already know: UV enhances the look of maple wood. 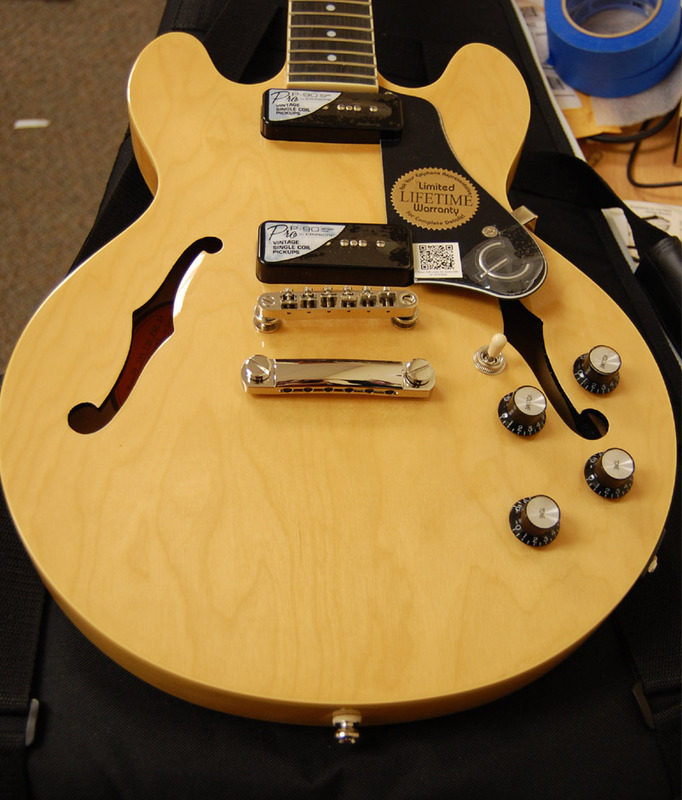 For this experiment, I chose an Epiphone 339 with natural finish. No color, no dyes, nothing but clear over maple. 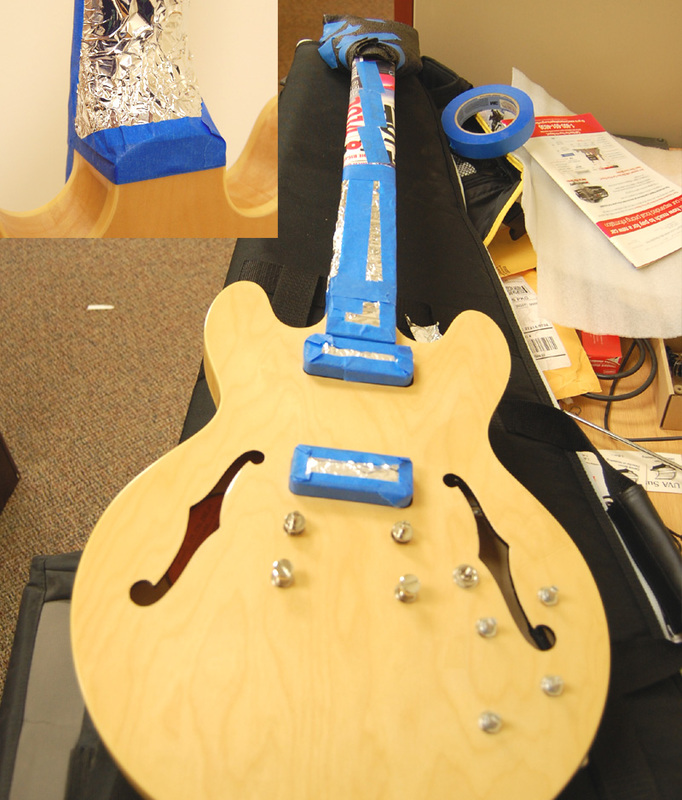 The neck is mahogany, and we will tape it off, perhaps to do another experiment in the future. The wood and finish fit my needs perfectly, but to be honest, I've been wanting a Gibson 339 with P90s for years, and this is the next best thing. Actually, this is the second one I ordered. The first I ordered was used, then it dawned on me that a used 339 might already have some aging as it could be 10 or 20 years old, so I scratched that plan and bought a new one. Fortunately, Musician's Friend had them on sale for under $400, which isn't much more than a used one. Not that it matters for this test, but I was very impressed with the tone and feel of the guitar. 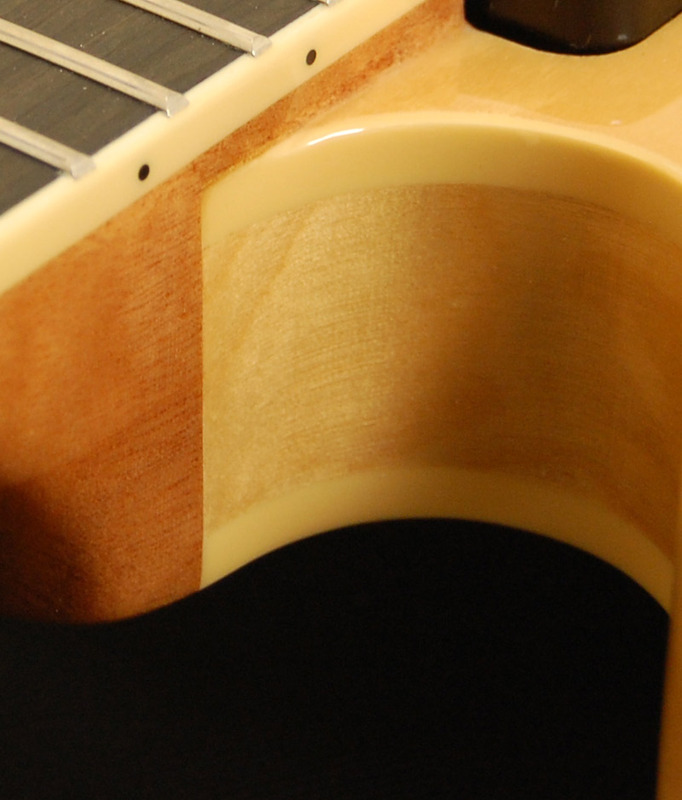 The finish is acceptable for an inexpensive guitar, but they did bleed a little black from dying the inside edges of the F holes. Still, not a big deal and overall, I was impressed with the value. 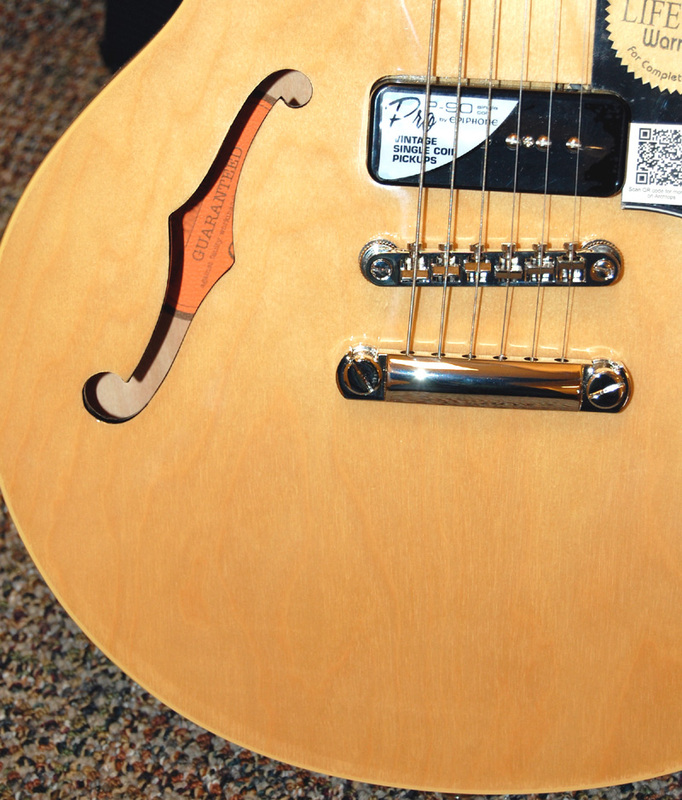 Made in China of course, but no shocker for a guitar at this price point. 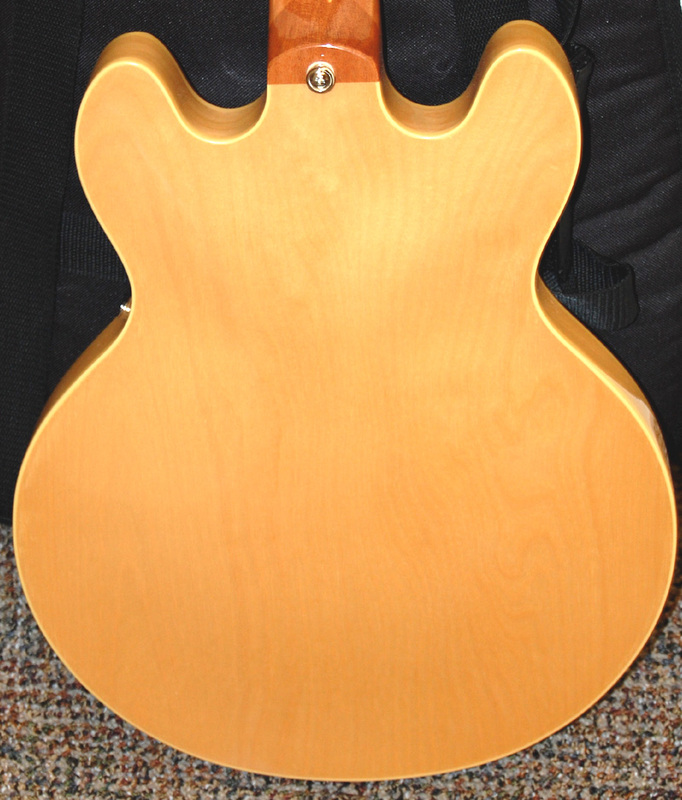 This is a good platform because it is an all maple guitar, which is the same wood used on most violins.. 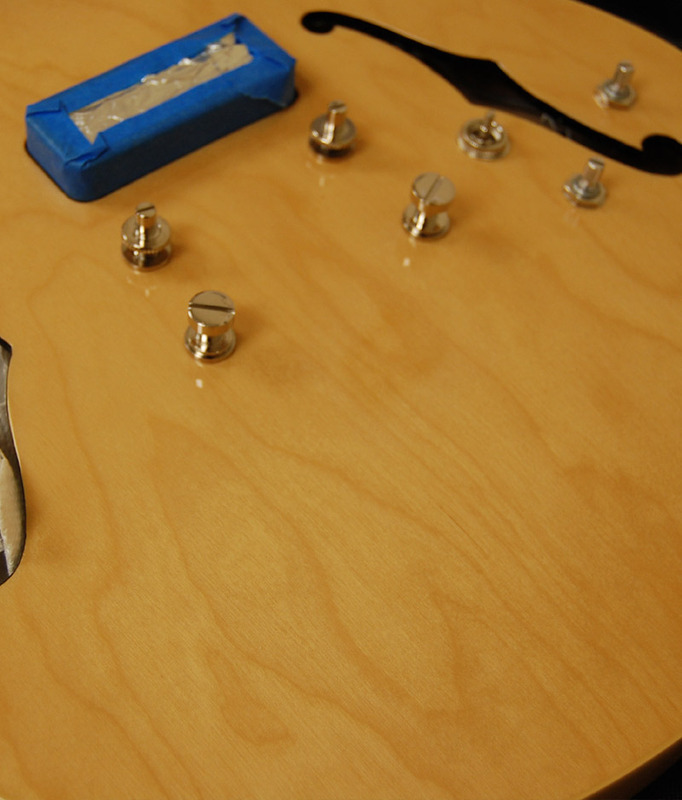 I will be stripping the bridge and stop bar off as well as the knobs and pickguard. Everything else gets tapped off with painters tape: the blue stuff. I learned the hard way, don't use masking tape, as the UV will break it down and then you have to use alcohol and elbow grease to clean up the mess. No permanent damage, just a mess. As usual, I'm going to run Rig #1 using SG-1-40 lamp at just 40 watts. This is the same as we run in our violin rigs, so this should give you violin luthiers an idea of what is possible. I have to flip it (the rig is a two sided rig) and that will double my time, but the time I will give will be based on a normal 4 sided rig. We will be using 8 lamps: 6 on the face, 2 on the side, which should reduce the time dramatically when compared to a 4 bulb rig. Then again, we are shooting though a polyurethane finish, which will of course slow down the aging. Still, we will be able to give you some good info that you can put to work, and a good demonstration of what our lamps will do for new maple. The camera makes the guitar look more yellow than it really is. It looks closer to the image at the top of the page. 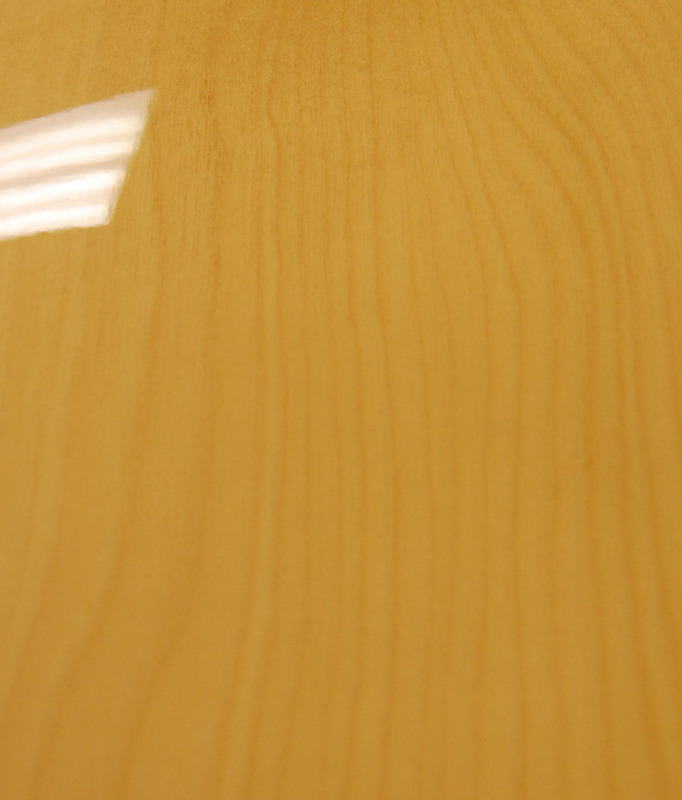 Still, you can see very little grain here, just flat white wood, not particularly exciting. You might notice we use a sophisticated reflector system to get in the nooks and crannies: Reynolds aluminum foil. There are a lot of other materials that work, but this is about as good as the rest, dirt cheap and easy to work with, so it is the material of choice for UV curing and aging. It didn't get much darker with 48 hours of exposure versus 24, but from experience I know that it will continue to get darker for up to a week. It just doesn't happen in a perfectly linear fashion. For this experiment, this is all the dark I wanted anyway. I had thought about aging it down to maximum darkness, but that isn't as practical as demonstrating what you can do in as little as a day or two. 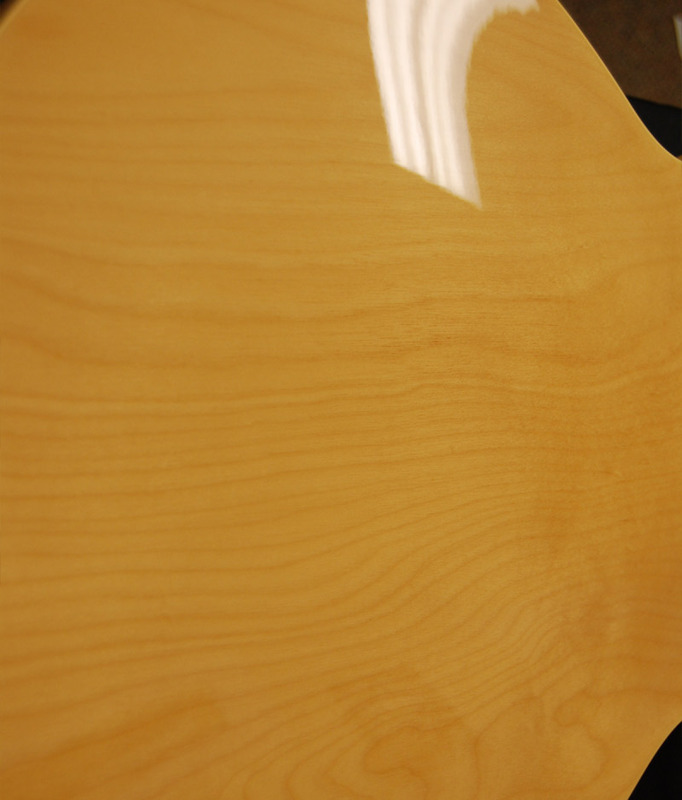 I think we've shown that just one day of UV will take a brand new clear maple finish and really bring it to life. The images aren't perfect and really don't do it justice. The one image with the neck joint just shows where it was taped off; the mahogany neck wasn't exposed this time around. You can also see the binding in a couple of these, which did age down just a little bit, picking up a little color, but nothing drastic. 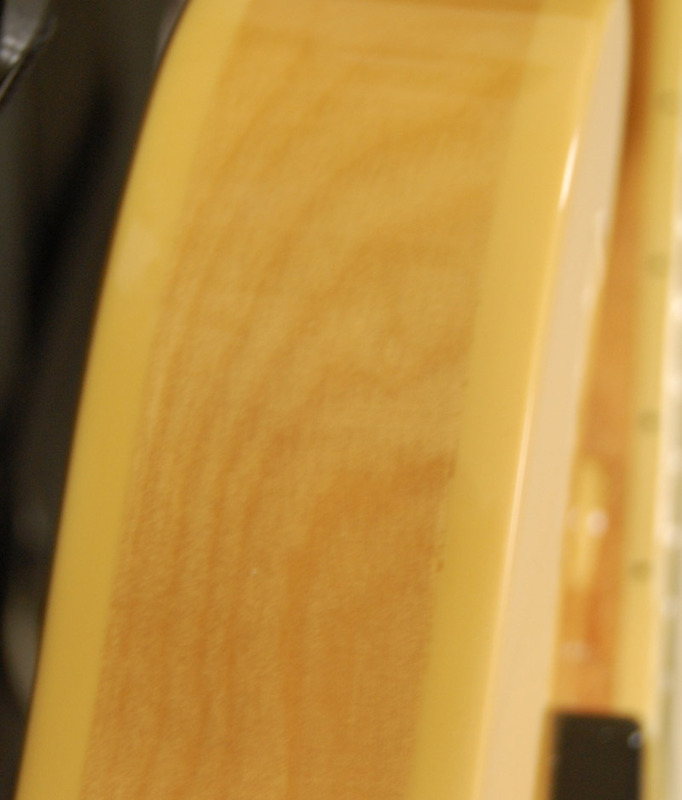 The guitar still looks brand new, not aged, but much warmer. There is nothing artificial about the color. Probably the biggest difference is the grain contrast. Instead of the color looking flat, the thin grain became much darker, giving the wood depth that simply wasn't there before. Additionally, we picked up a nice golden hue that looks fantastic. Not enough to make it look "aged", but just enough that it looks like a higher quality instrument to the eye. 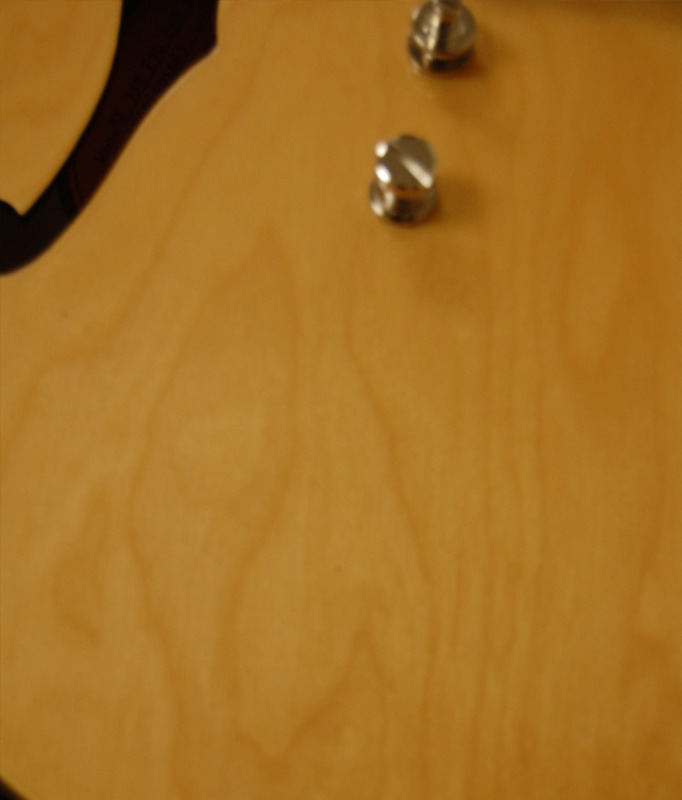 This is something that can be done to any maple instrument using as little as 4 Solacure SG-1-40 bulbs. Use 3 on top, one on the side, flip over after one or two days, I used 8 bulbs for this but ran them at just 40 watts each. One or two of our Violin Kits would accomplish this, and the lamps are likely to last for years. In the end, I think this was an extremely successful demonstration, showing how minimal lamps and minimal time can take an average guitar and make it look much more expensive.